Prunus africana | Infonet Biovision Home. Prunus africana is native to the montane tropical forests of Sub-Saharan Africa and Madagascar. It occurs in wild in forests from 22 countries, majority in the Eastern and Southern Africa region such as Ethiopia, Uganda, Kenya, Tanzania, Zambia, Malawi, Mozambique, South Africa, but also Cameroon, Nigeria, Sao Tome, and Angola. A valuable timber and medicinal tree has more recently come under heavy pressure for wild harvest for timber and bark extraction, as there is a fast growing market for the bark. It has been added to Appendix II of CITES list of endangered species, for regulation of trade from wild harvest. Kenya has the largest planted area (628 ha planted by year 2000), but the tree is increasingly becoming a popular agroforestry tree and coppices (it can be cut back and produces shoots from stools or roots) well when young. Leaves and twigs contain the same medicinal properties as the bark; so it can be harvested sustainably while coppicing the tree in agroforestry systems. The timber is hard and durable and is used in Africa for the manufacture of various household products such as axes, hoes and furniture. Prunus works well as shade tree for coffee plants and other crops. It grows best in tropical highlands from 1000 to 2500 m above sea level with rainfall between 500 to 2000 mm/year and fertile loam soils. 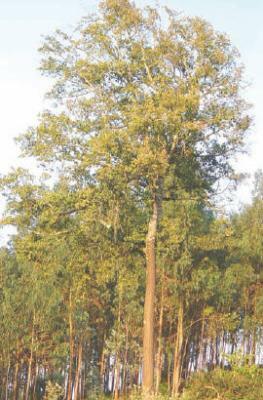 An evergreen tree up to 25 m tall or rarely, a shrub. In the forest the dense foliage is open, in grassland the tree is more stunted. The bark is black to dark brown, and has a rough corrugated or fissured and scaly texture, fissuring in a characteristic rectangular pattern. The leaves are leathery, glossy dark green and have margins with shallow rounded teeth. The leaf stalk is typically pink to reddish brown. The fruit is red to brown, rounded and about 1 cm; it is often bilobed containing one seed in each lobe. It grows in bunches. Prunus flowers and fruits are formed about 4 m high. The seeds are collected from underneath the trees. Seeds from dark red to brown fruits germinate better than seeds from green fruits. Remove the fruit flesh and sow the seeds in a nursery while fresh. They do not store well. Also wild seedlings (wildlings) can be collected and planted. There is evidence that seeds and seedlings survive best in soil with relatively high humus content. Nursery soils should contain either peat or decomposed sawdust. Seeds generally germinate 50 to 90 days after planting. Up to 50 seedlings/m2 in the nursery can do well - with higher density the survival rate diminishes. Young seedlings need about 40% shade. Plant young seedlings on contours and borders. Prepare two- feet deep planting holes. Fill it with black soil mixed with compost and leaf matter. Water once a week for the first year. Use a filled and suspended bottle or other water conserving system. Do not harvest bark till the tree is at least 30 cm in diameter at breast height. From trees 30 to 50 cm diameter two bark panels of not more than 15 to 20 cm wide can be harvested from each side of the tree from about 1 metre above ground level up to the first branch. After 4 to 5 years two more panels can be harvested on the other sides of the tree. If bark is over harvested the tree dies. However leaves contain the same medicinal properties as the bark, so leaves can be used in local medicine. From younger trees only the leaves and twigs can be pruned or coppiced. At least 4 European companies are actively buying bark of Prunus africana. In 2000 the bark trade amounted to US$ 150 million/year or 3.500 tonnes of this commodity. It was estimated that this demand would triple or quadruple to 7 to 11.000 tons/year in export and about 500 tonnes/year for use in Africa the next few years. The active ingredients in Prunus africana are effective treatment for benign prostatic hyperplasia and prostate gland hypertrophy (enlarged prostate gland), ailments that affect about 60% of men over the age of 50, especially in Europe and USA. 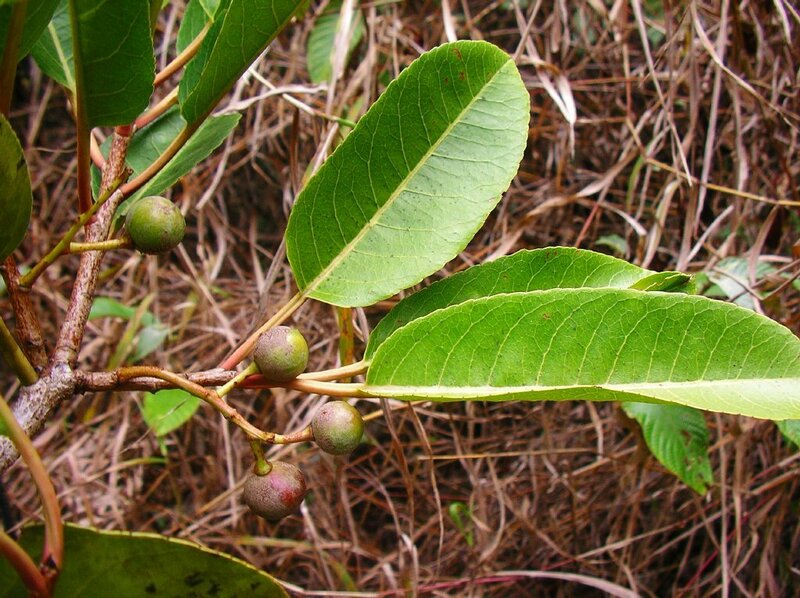 Traditional healers also use the bark in treatment of stomach ache and wound dressing, infusion of leaves is used to improve appetite, treatment of both bacterial and non-bacterial chronic prostesis and genital infection as well as hirsutism in women. These are mainly coleopterous borers causing wood degradation, but there can be pathogenic fungi affecting nurseries.